Raising livestock takes more land than raising produce, and it wasn't until 2011 that I found some excellent pasture available located very close to the vegetable farm. With abundant pasture, the flock has grown to well over 100 ewes, some rams and lots of lambs. Few types of work are more enjoyable than tending to healthy livestock. The busiest time of year is lambing time, which conveniently wraps up as the work with the produce begins to increase in the spring. The flock is made up primarily of the suffolk breed. 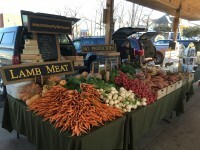 We raise them mainly for meat, which we sell at the Harrisonburg Farmers Market and to local restaurants. We also have breeding stock to sell throughout the year. All content property of Seasons Bounty Farm.